The demise of many human lives in Mecca crane crash was the saddest news of the week. The Pakistani officials on Sunday confirmed that six Pakistanis have died in a crane crash incident in the Saudi city of Mecca late Friday during annual pilgrimage. 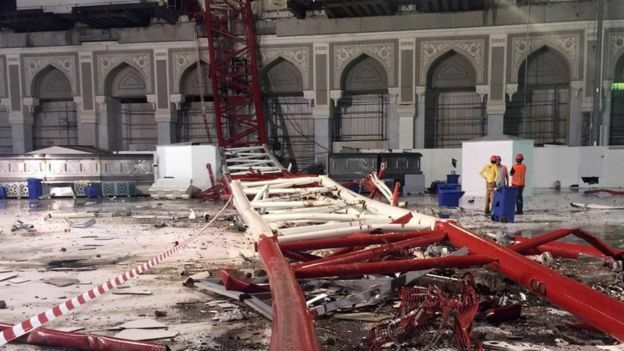 Saudi officials said that 107 people were killed and nearly 300 wounded when a crane toppled over at Mecca’s Grand Mosque in Saudi Arabia due to strong winds and rains. Pakistani Ambassador in Saudi Arabia Manzoorul Haq said that six Pakistanis were killed while 36 were injured in the deadliest crane crash. In a statement, the ambassador said that the injured Pakistanis were receiving treatment in three hospitals in Mecca. Pakistani mission released names of those died in the incident. Pakistani sources said that at least ten Pakistani intending-pilgrims were missing. Over 150,000 Pakistanis are performing Hajj this year, according to the Ministry of Religious Affairs. While Saudi authorities said on Saturday the annual Hajj pilgrimage would go ahead despite crane collapse, in which 107 people were killed, where crowds returned to pray a day after the disaster. Hundreds of thousands of pilgrims have already arrived in Mecca for the haj, one of the world's largest religious gatherings which last year drew two million worshipers. Two Indian pilgrims also expired in the crash. This was one of the most deadly incident of the week around the world in which dozens of people lost their lives.